Entertainment Earth has the Finn (First Order Disguise) vs. Captain Phasma two-pack on sale as today’s Daily Deal. Click through for the order page if this price is right for you. ← Ollie's Finally Advertising $200M Toys R Us Liquidation Stock! Let’s look at the Captain Phasma Titanium Series figure. It’s not great. See more in our Research Droids Reviews today! Be sure to leave your thoughts in our comments section, vote in the poll or even comment about it on our Facebook page. Click the banner below for the direct link to the review! As always, you can also send your review requests via email if you’d like to see something that we didn’t cover yet. BREAKING NEWS! TBS6 [P3] Dryden Vos and TVC Captain Phasma Revealed! Hasbro reveals The Black Series [Phase III] 6″ Dryden Vos and The Vintage Collection Captain Phasma (a rumor first revealed here at JTA MANY moons ago) at FANEXPO Canada and showcases them on their Hasbro Pulse Instagram page. UPDATE: Official PRESS IMAGES HERE. Entertainment Earth has provided our review sample of the Finn (First Order Disguise)/Captain Phasma Two-Packs set. It’s a decent set and has relevant accessories and lots of all-new tooling. Learn more about it in our Research Droids Reviews today! Be sure to leave your thoughts in our comments section, vote in the poll or even comment about it on our Facebook page. Click the banner below for the direct link to the review! As always, you can also send your review requests via email if you’d like to see something that we didn’t cover yet. We have a sneak peek of the Entertainment Earth exclusive Finn (First Order Disguise)/Captain Phasma Two-Packs set from the Star Wars [The Last Jedi] line. As you may or may not know, this set was temporarily canceled until Entertainment Earth salvaged it and took it on as their exclusive. The set is more excellent than expected. The Finn (First Order Disguise) turned out nicely. He still comes with inadequate articulation of which is required to battle Captain Phasma. Captain Phasma is all-new as well but has been significantly retooled. And most importantly, she comes with the spear she used to attempt to defeat Finn. The figure uses Force Link technology. Interestingly, you can use the Force Link 2.0 wristband to make the figures talk. 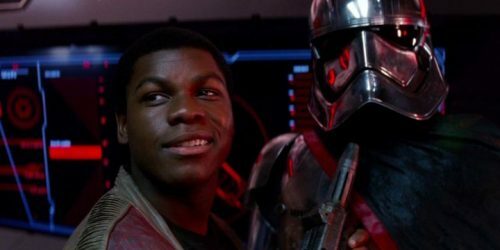 Between Captain Phasma’s rich English accent and Finn’s fast-talking, it’s challenging to make out their five phrases each. Anyway, check out our full gallery ion this set. We thank Entertainment Earth for providing us with this sample for review. The review is coming soon! Order yours today HERE. ← Did They Rush Through The Second Run Of 40th Anniversary Or Something? Captain Phasma (The Last Jedi) is up next for our S.H. Figuarts Visual Guide updates. Click below to have a look at our full Visual Guide for this figure. You can also visit our full review for additional details. It’s time to start looking at S.H. Figuarts figures based on Star Wars Episode VIII: The Last Jedi. Let’s begin with Captain Phasma (The Last Jedi). She is the focus of our Research Droids Reviews today! Be sure to leave your thoughts in our comments section, vote in the poll or even comment about it on our Facebook page. Click the banner below for the direct link to the review! As always, you can also send your review requests via email if you’d like to see something that we didn’t cover yet. Force Link Flametrooper, C'ai Threnalli, and Phasma/Finn 2-Pack Pre-Order! It looks like Entertainment Earth has saved some figures! Entertainment Earth has listed 3 exclusive The Last Jedi Force Link figures (C’ai Threnalli, First Order Flametrooper, and the Captain Phasma/Finn (First Order Disguise) Two-Pack) that were originally intended for the mainline, but look to be “Cancelled” in order to prepare for Solo: A Star Wars Story. Click below to order! These are listed as only available on Entertainment Earth! Found! TBS6 [P3] Wave 15 Hits Toys R Us! Found! The Black Series [Phase III] wave 15 figures have been found at Toys R Us in Ft. Wayne Indiana! We exclusively revealed what figures would make up part of this case assortment last year. Sadly, as expected, the First Order Stormtrooper is exactly the same as the 2015 figure. (Hasbro, you really couldn’t update the helmet?) And even worse, Captain Phasma has not been given her staff and still has the same bulky body. Oh well. Special thanks to JTA reader Ian D. for the alert! ← Amazon Lists New Star Wars [The Last Jedi] Force Link Figures! Amazon has also listed a new Two-Packs set of Captain Phasma and Finn (First Order Disguise) Force Link figures. Check it out! We have another Rogue One 2-pack as today’s Visual Guide update. Click below to check out the Captain Phasma/Finn (Jakku) set. Make sure to also check out this set in our review database. We didn’t even know this set existed until recently. It wasn’t needed either. Check out the Captain Phasma/Finn (Jakku) Two-Packs set in our Research Droids Reviews today! Be sure to leave your own thoughts in our comments section, vote in the poll or even leave comments about it on our Facebook page. Click the banner below for the direct link to the review! As always, you can also send your own personal review requests via email if you’d like to see something that we didn’t cover yet. When I look back at the third phase of The Black Series 6″ line through the recent reveals at NYCC, there is a diverse assortment of about six figures that really stand out to me. Lando Calrissian and the Imperial Royal Guard from wave 11 are definitely two of Hasbro’s best efforts. But then when I jog my memory further back in history, I remember the excitement of waiting to acquire the First Order Stormtrooper and Captain Phasma from wave 1 and wave 2 respectively. (That was of course before I saw Episode VII.) And then what a joy it was actually attending the HASCON convention and get the exclusive Clone Captain Rex. It’s going to be so exciting to see his “photo realistic” face deco in person. And the NYCC-revealed Rey (Island Journey) was a nice surprise too. She’s a nice-looking figure that’s also coming with “photo realistic” technology. You can truly see how far they’ve come in this format. These are not fourth rate action figures. No, they ride the crest of the wave of action figure superiority as far as we’re concerned. I wouldn’t mind seeing them again before the end of the year in fact. Let us know what figures stand out for you too! With special thanks to JTA reader Ben S. for the alert, TARGET online has put up The Black Series [Phase III] new Titanium Figures up for order! 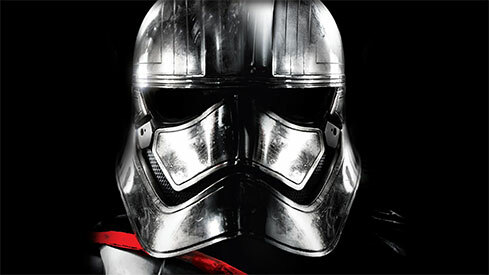 Discover Captain Phasma’s History in an Exclusive Excerpt! Check out your first glimpse at Phasma’s desolate homeworld of Parnassos and her initial encounter with the First Order in this exclusive excerpt from the upcoming novel Phasma on StarWars.com! Pre-order Phasma right here. We previously reported on an upcoming Marvel comic series featuring Captain Phasma and there is also a new Phasma novel due out on Sept 1st. 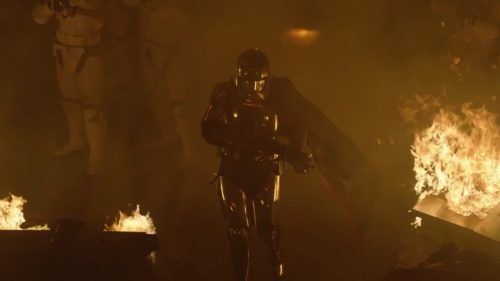 This seems to be an awful lot of story coming for a character who had nearly as much screen time as the Nightwatcher Worm, but she is supposed to be utilized much more in The Last Jedi and both Gwendoline Christie and Rian Johnson have seen to that by creating her new backstory. More after the jump. 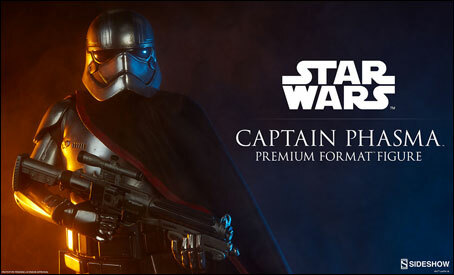 Captain Phasma Premium Format Figure is the latest announcement from Sideshow’s Online Comic-Con event. Click here for the preview page. Look for pre-orders for this figure soon.